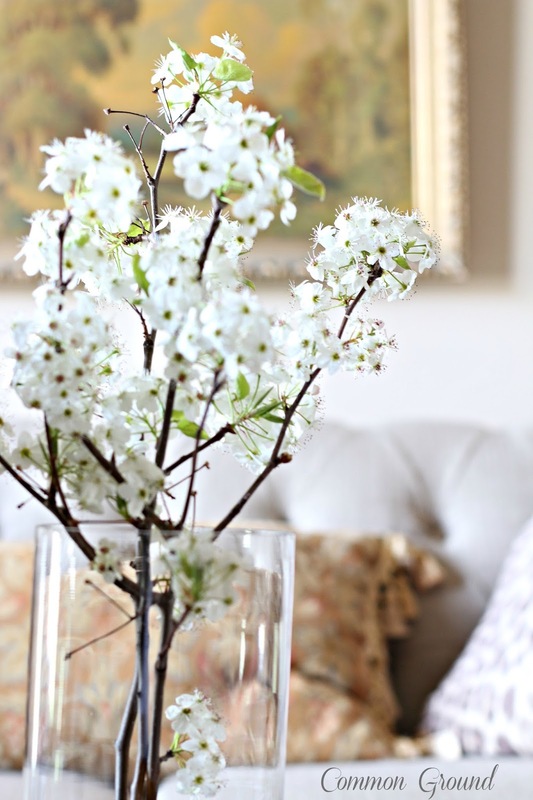 until I actually took a deep breath to inhale the delicate white blooms, that look a lot like Spirea, or Bridal Veil, and then I got a huge surprise... they're the stinkiest plant I've ever smelled! let's just say one whiff and they were not interested any longer. But I still brought them in because they're so dang pretty. 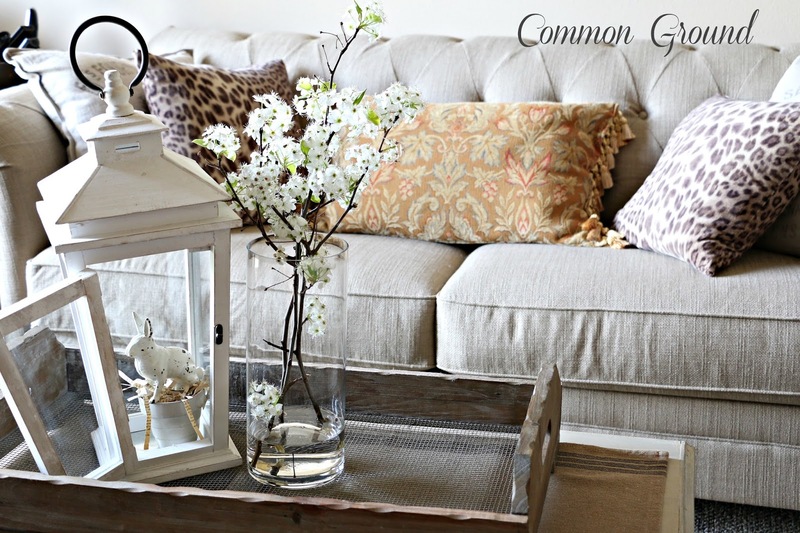 and besides, I wanted a new coffee table vignette. This is one of the lanterns from Pottery Barn that I ordered last Christmas. 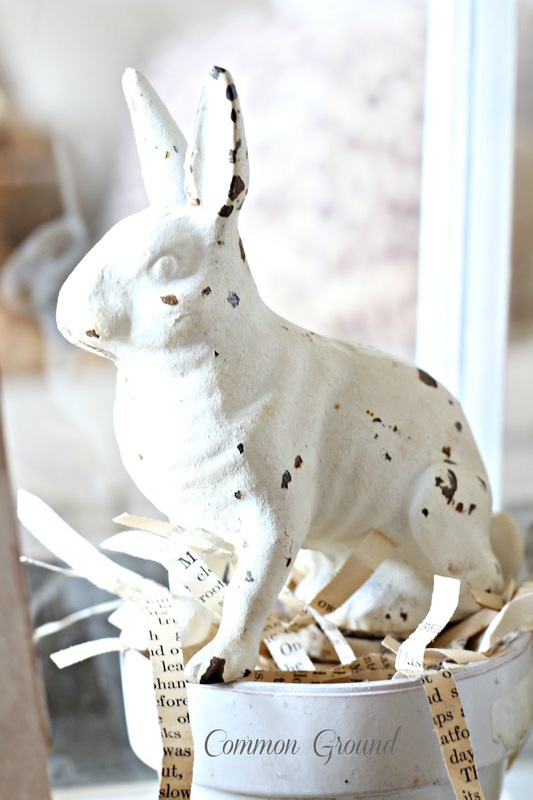 so it's an iron rabbit, on a vintage flowerpot. on a frenchy farmhouse tray with a chicken wire bottom. 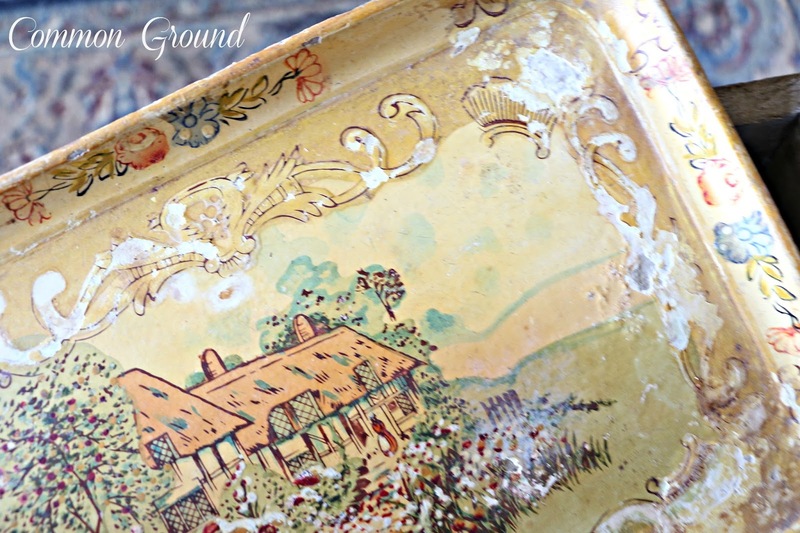 While I was taking pictures, I decided to add in this old paper mache tray for some more coordinating color. I looked past the damage. Sorting out things for a garage sale, I realized that there were two pillows that might work on my new sofas. When I brought them over, I saw that the caramel really highlighted the colors of the vintage print. So I think they'll stay. an old bed pillow is inside. but it works for me, since there's not much pattern in here. Here's the loveseat, and another pillow I had used in the living room on my Bergere chairs once they were "slipped". I think the tans, browns, and creams pull it all together. Hope you're having a beautiful Easter Week. LOL - yep we have 3 huge Bradford pear trees in our backyard, and I remember the first time I sniffed them up close - har har, yep, beautiful but stinky.....but doesn't stink up the house, just when you SNIFF. Happy spring to you, lady! Hugs! 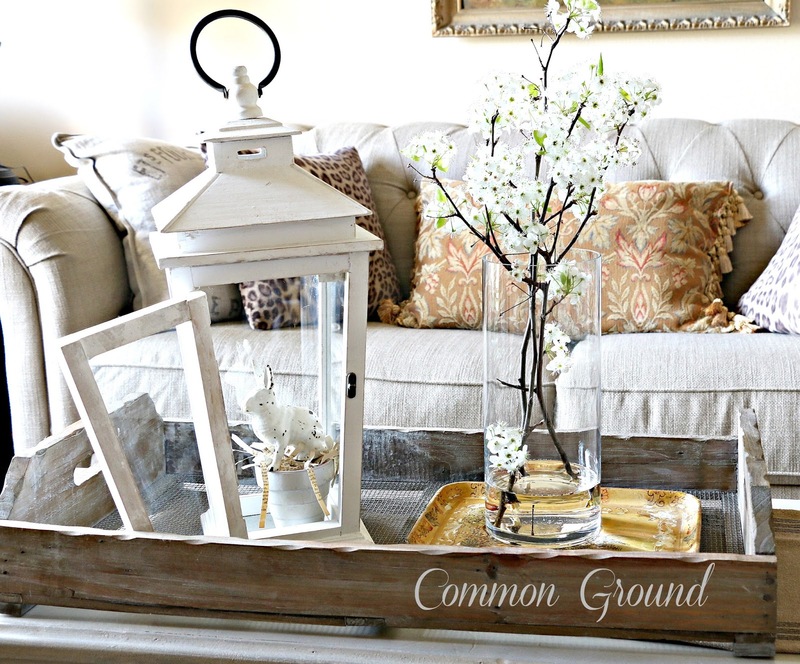 Such a lovely coffee table arrangement. I do like the combination of pillow patterns as well, but absolutely love the new sofa. I love bringing branches inside! Sorry they are stinky but if it helps, I can't smell them from here! And they look lovely on your table. The new,old pillows look good too. I am getting ready for our garage sale this weekend. Good Luck! I think it all looks great, Debra! 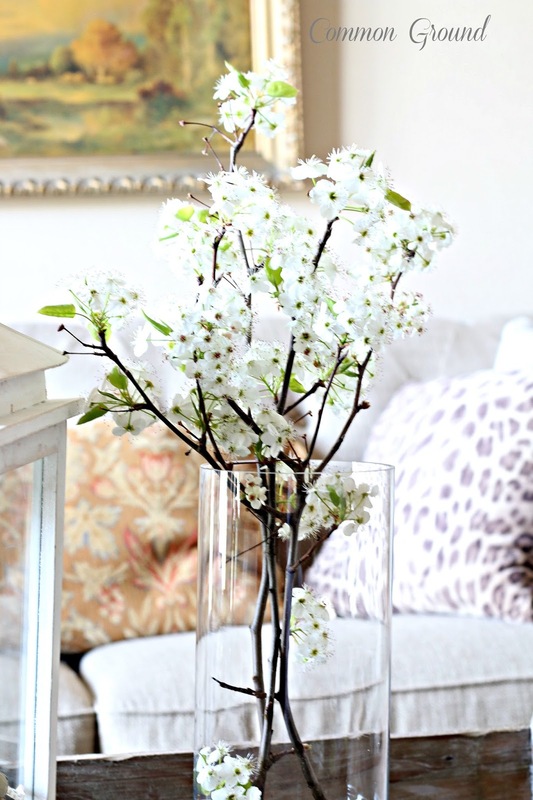 I had two flowering pears in our yard in NY and I never did cut any of the branches. If they stink that much I'm glad I didn't! This is probably one instance where faux might be better! : ) Love your little iron bunny in your beautiful lantern. It makes for a lovely vignette. I think your pillows look good on the couch. I think animal print can work with just about anything. Very, very pretty. Pear blossoms really do stink. I wonder why? Still, like you say, they are very pretty and full of spring. Nothing like that blooming here yet, but that is good since we're getting a heavy frost tonight. Your pillows look great together! I never smelled pear tree flowers before but on your advice I don't think if I run in to one I would smell it. They do look ever so pretty! I love your table vignettes, but then I always do. You should be come a table vignette consultant. You're not far I'd be a customer! Happy Easter, our Lord has risen! I love the leopards. I have never smelled a bradford pear before-see you have saved me. 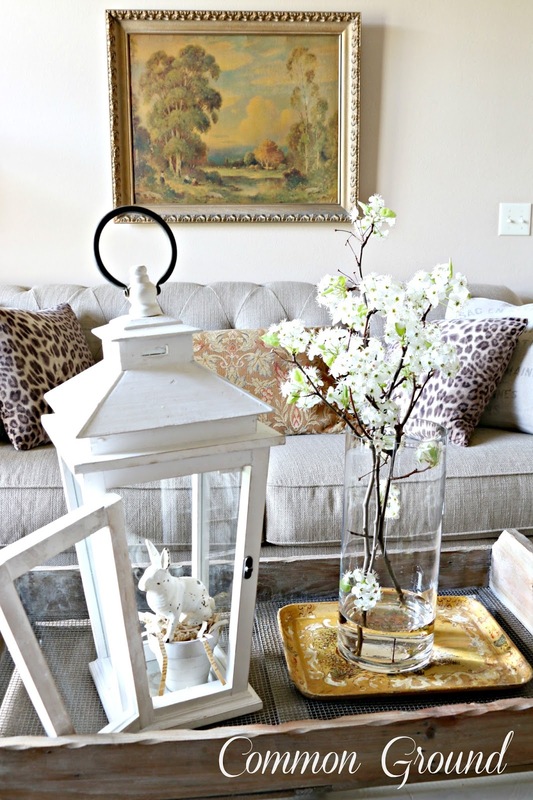 Love the pillows and love the pretty vignette on your coffee table!! Isn't it funny how smells can evoke memories? I can remember the smell of Bradfords from when I was 6 (and that's a LONG time ago), when visiting my sister who was in the convent in Stella Niagara, NY. Every spring that memory comes back to me, faint in all other details, yet so vivid in smell. Your table has a great Easter look to it, Debra. Your coffee table it styled perfectly! Love that bunny & cannot believe that those flowers stink! You're so cute! The Bradford Pear is gorgeous, too bad it smells bad. 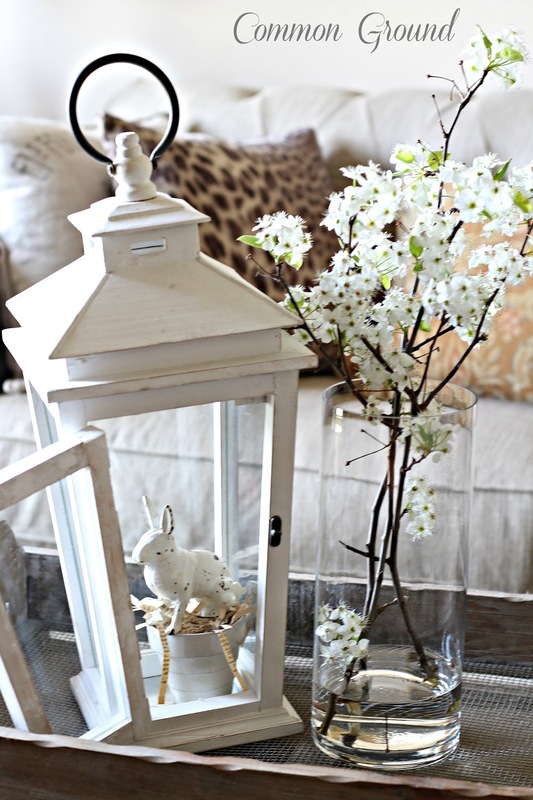 Love your Easter vignette!! I hear you on the stinky trees! We have one! Lol. 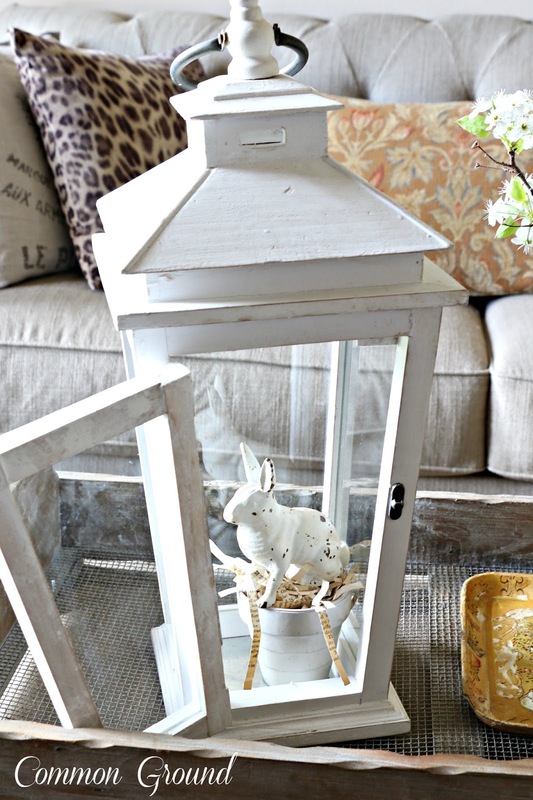 Love your lantern and vignette. So pretty! Oh you just made me laugh with the stinky trees :) I heart you! All my neighborhood streets are lined by those trees, pretty stinky but pretty ;) Beautiful vignette! 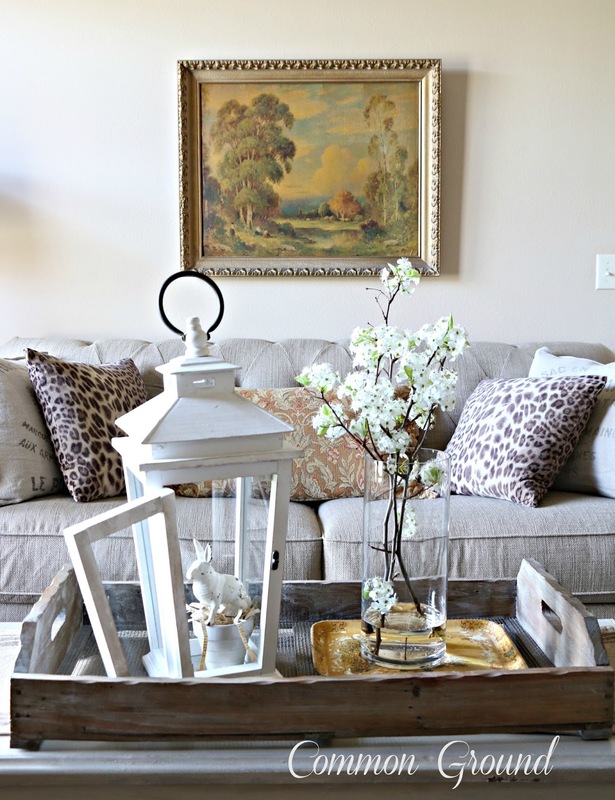 What a lovely vignette on your coffee table, love your new sofa too! We have two pear trees in our back yard, finally blooming! I always cut some for inside. Ours are not Bradford, but what I believe to be Cleveland Pear. The Cleveland Pear is less likely to break during windstorms. The shape isn't the same as Bradford, but the blooms are the same. The one beside the patio is so large now it practically fills the bay window in our room. Really brightens the room when it blooms and cools it in Summer with the green leaves. I never knew the branches smelled bad and yet they are so pretty! What a shame. I feel the same way about paperwhites that people force to bloom indoors at Christmas. You can smell those across the room. Your table vignette is very pretty. 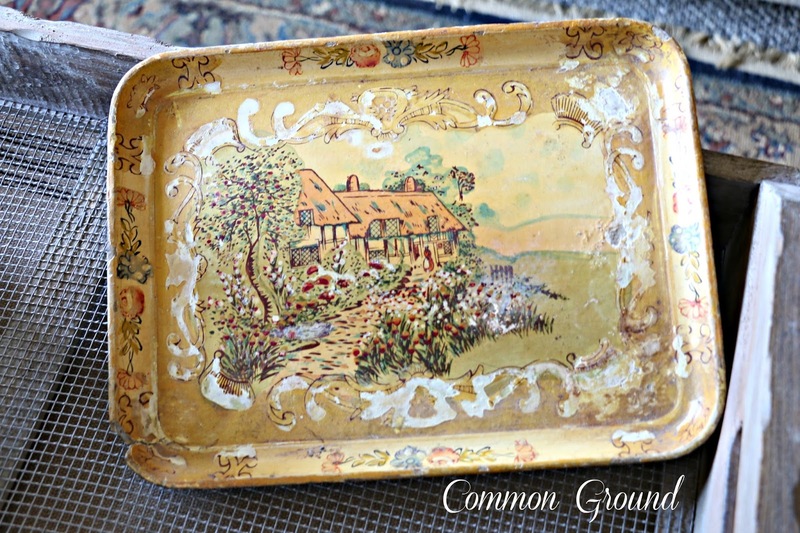 I LOVE the old tray! And I have to get some ideas to pretty up a few lanterns I have. You always get yours right! Love the pillows, too. 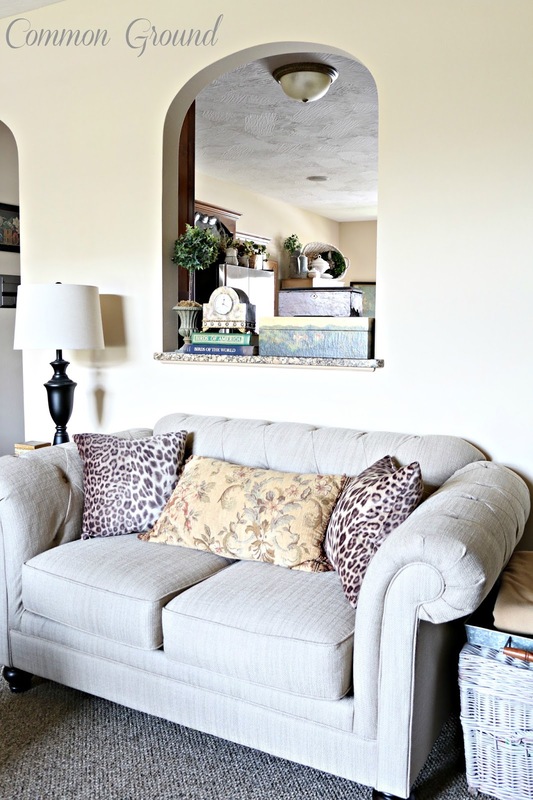 You can't go wrong with one or two animal prints in any space. The things we put up with all in the name of decorating (even stinky flowers)! Ha! It all looks beautiful, Debra! I love your pillows and your pretty vignette. Happy Easter! Beautiful blooms...sorry about the scent. I have never cut some branches, so I didn't know that they had an awful smell...thanks for telling us. Love the tray. Happy Easter Debra!!! Too funny! They definitely look better then they smell! Almost like all my Allium bulbs...I was so disappointed when they turned out to have a metallic smell...but they sure are gorgeous! 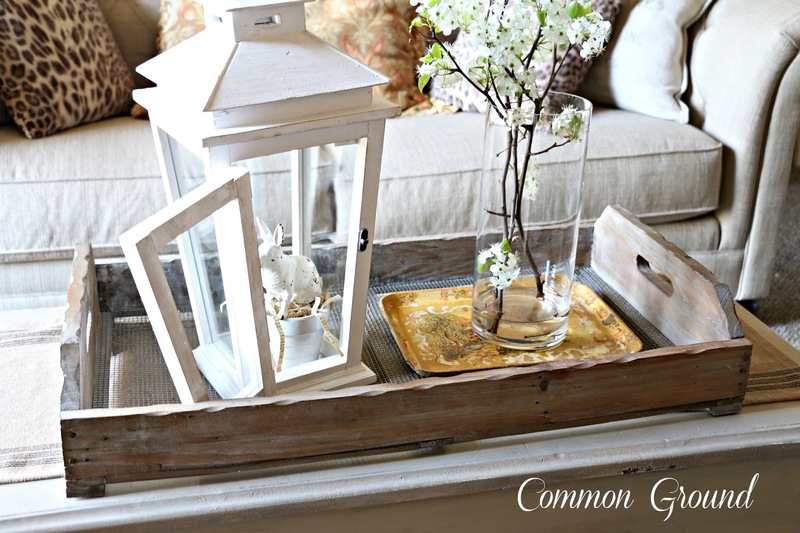 Love your coffee table vignette and the cute post! I would have loved to witness your reaction when you stuck your nose to them! Talk about stank eye!!! I feel the same way about an iris...showy, but pea-you! I'm not a fan of eau de dirty laundry. We're planning on heading your way in the near future so keep your eyes peeled for two old mules tearing down the road! You put together the most wonderful vignettes ~ always a joy to visit here. I think those blooms are beautiful on your coffee table. I don't have those in my yard, so I had no idea they didn't smell good. I think your pillows work well together. 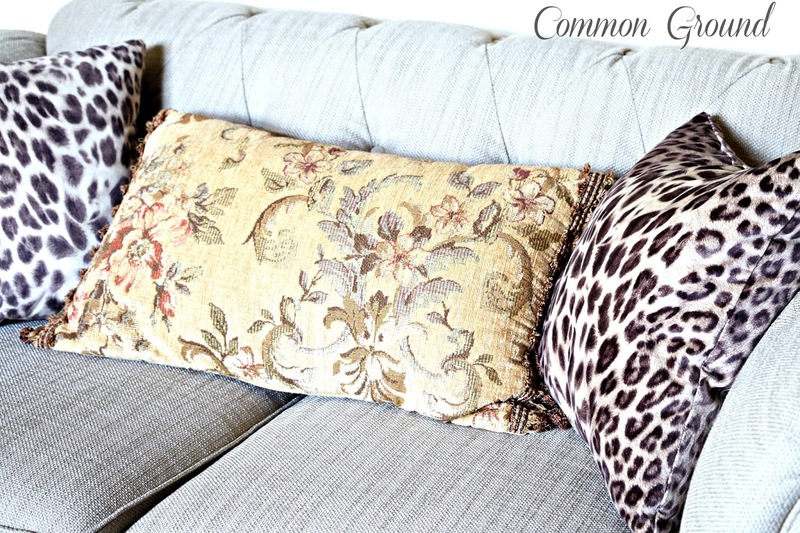 I love the leopard pillows! Everything looks so fresh and new. I stumbled across this Etsy shop. I wondered if you were familiar with it? The stuff in it reminds me so much of you. I was just commenting here under you, and I saw that you had found edithandevelyn...She is my friend! We attend a Mobile estate sale together sometimes. Her romantic French style is so easy on the eyes...she has a blog too that you might enjoy. Thanks for the warning about the beautiful pear blossoms! I had always wondered...I love the pillows with the decor, and the table vignette is so pretty. I just want to say ! WhY don't men get this ? Why ??????? Mens mantality is like scrambled eggs . Men exist on three plains FOOD -SLEEP- and you ladies all know the last one ! How boring ?? Oh yah sports . Loving that middle pillow as soon as I laid eyes on it. Debra, Everything is really pretty and I love the new sofas. Oh Debra, you made me laugh. I have never smelled th2m before... so many allergies, I am afraid to sniff the unknown. Now I know I will not be doi8ng so anytime soon. Such a beautiful vignette! 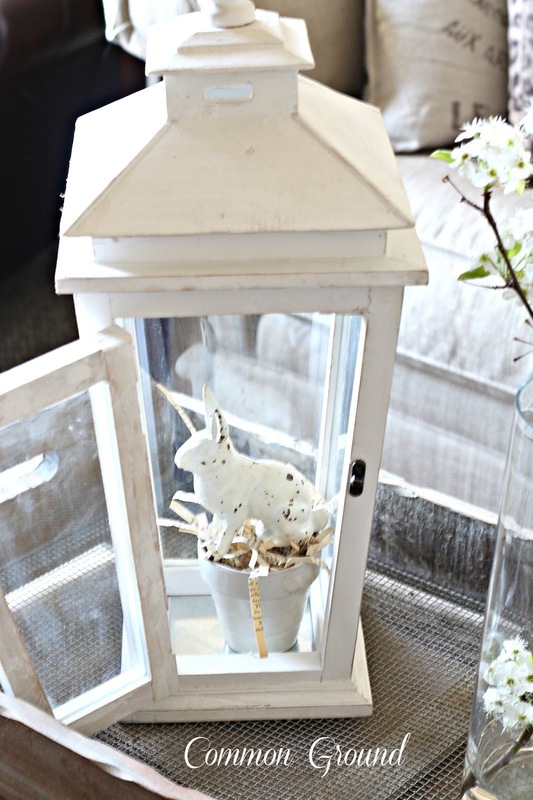 It was such a great idea to give the bunny more presence by placing it on a flower pot! I don't think I would have thought to do that and it looks so cute! Thanks for the laugh, Debra! Who would imagine something so pretty wouldn't smell wonderful :) Everything looks beautiful, and I'm in love with your little potted bunny in the lantern- so adorable! What a beautiful vignette Debra! I had to laugh too :) When we moved to TN last year, I was warned about the Bradford Pears...but I still had to smell them, you know, just to see for myself ;( We have one in our yard and I would love to bring a branch inside but my pollen allergies would probably go off the scales! I can enjoy it in your house though! Where did u find your beautiful couches. I'm in the market for new ones? 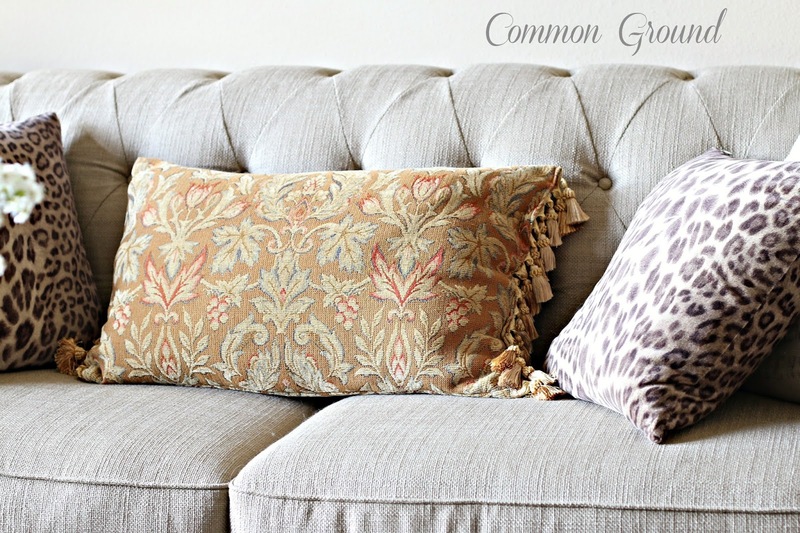 LOVE that couch and how you mixed the patterns on the pillows! Funny - stink, stank, stunk. :) I'm glad you had not already gotten rid of the pretty pillows! LOVE the mix. I'm laughing now Debra, spent the entire day in the garden and I didn't think to smell my Bradford Pear tree. I even weeded a few Dandelions below it. Sure did awe over it's gorgeous blooms. Now tomorrow I will give it a sniff. Stink, stank, stunk. lol! I've been thinking of bringing some indoors as well. Your vignette is perfect! 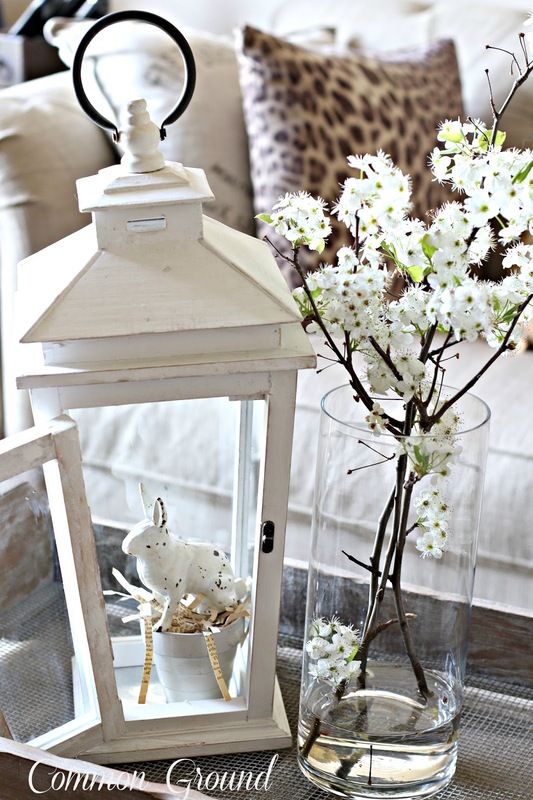 Love the little bunny and the chicken wire bottom tray! The cottage is ever so sweet. I think the pillows work fabulously together! Have a very Happy Easter and thanks for sharing with SYC. 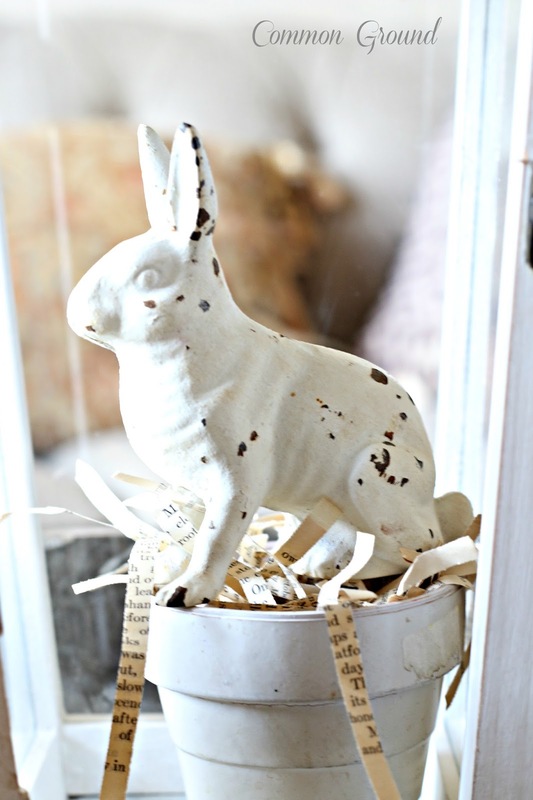 Love the vignette and the cute little iron bunny. 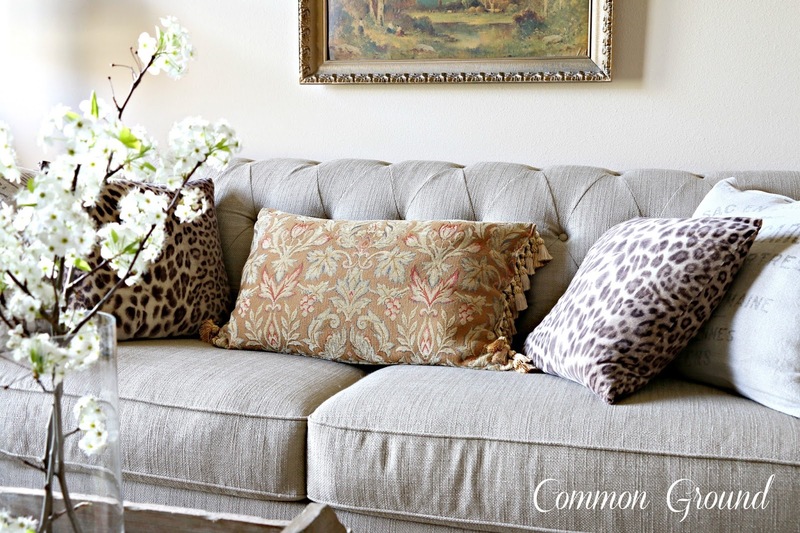 Love your tufted couch and leopard goes with anything. I love the mix. A true vision of loveliness in your Pear blossoms! I got a chuckle out of your sensory experience!!! Love, LOVE, L O V E the "new" "old" pillows on the sofas. . . Here's to an amazing week ahead!! !